Press Release:- The National Housing Corporation (NHC) is suing residents of La Clery who protested against the demolition of the La Clery CDC structures earlier this month. This is according to documents of the High Court, filed by the NHC lawyers on June 13, 2018. The NHC is claiming that because of the protest, its contractor was not able to complete the demolition and as a result it will incur a further EC$34,000 in remobilization cost that the NHC can ill afford to pay because of it “dire financial situations”. Last year chairman, Mr. Timothy Mangal of the NHC declared that that NHC was “bankrupt” and some social housing advocates have suggested that the NHC is “unfit for purpose” and should be the subject of a performance audit to find new way of getting it to fulfill its mandate of providing access to housing for low income Saint Lucians”. 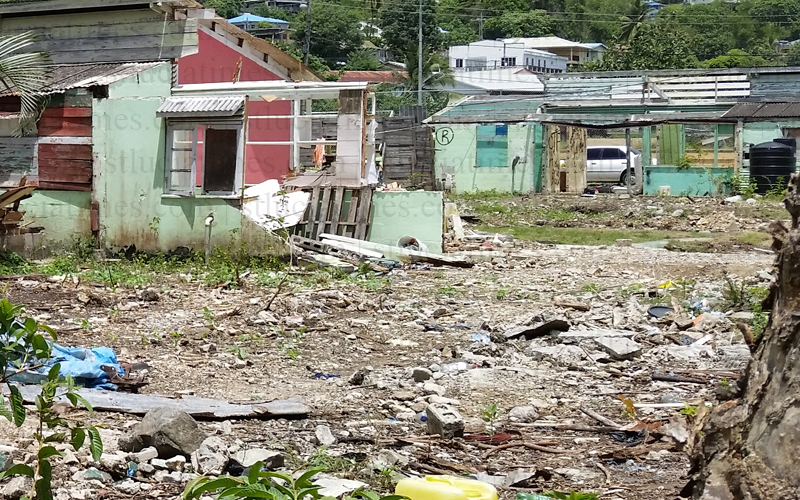 This according to the NHC’s claim would significantly hinder the NHC meeting its obligations to provide affordable and safe housing for the people of Saint Lucia. The residents, many of whom are descendents of the victims of the great Castries fire 70 years ago, recently formed the Tafari Charlemagne Community Housing Association, with a mission to “improve access to affordable housing and the quality of community life for low income residents of La Clery CDC and North Castries”, have called on the NHC to engage them in an empowering manner, in the process of regenerating and redeveloping the communities housing stock. 70 years after the descendants of these people were made homeless as a result of the fire, their families are still housing insecure and destined to be displaced again, never finding peace and security. Over 200 local residents (in and around the immediate La Clery CDC area) have signed a petition calling on the authories to engage and empower the Tafari Charlemagne Community Housing Association in the process of regenerating and redeveloping the community. The NHC has requested an expedited hearing and the claim is scheduled to be heard on Monday the 25 June 2018 at 9 am in Chambers. Lol..is that even possible for them to sue protesters..or they trying to buy an excuse for having no account of the funds. It is ashame that those who reoccupied the houses after the original occupants had left and who has never paid a month rent are the very same ones refusing to leave. That’s rubbish. One family children has decided to branch off and go into vacant apartment and they make the mist noise. Pay NHC their over 20 years of rent first . Then negotiate. NHC don’t have money to maintain the buildings but they have money to pay lawyer. Terrible service from a garbage landlord. No wonder so many people don’t pay rate.